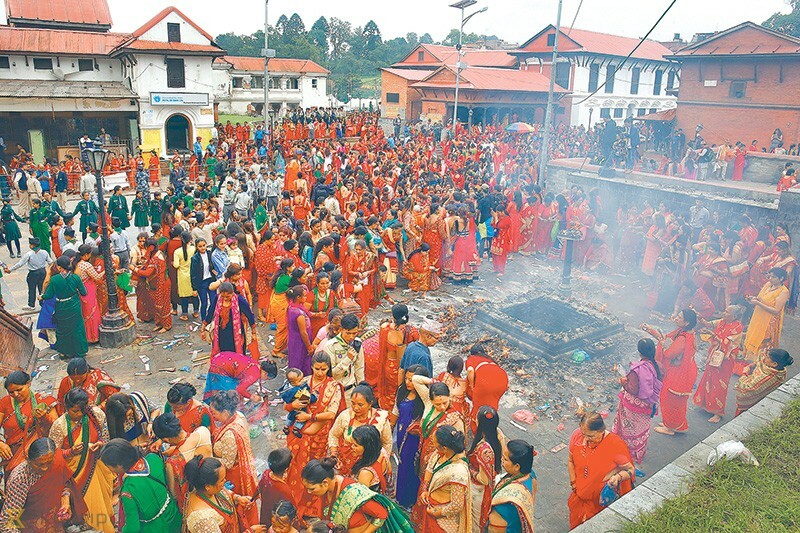 Thousands of Hindu women thronged the Pashupatinath Temple in Kathmandu on Teej festival on Wednesday. According to the Pashupati Area Development Trust (PADT), nearly 70,000 devotees stood in queues to enter the Pashupati Temple from early morning. The PADT had assigned three routes leading to the main temple complex this year. The temple gates were opened for devotees from 3 am. Teej is celebrated by Hindu girls and women to celebrate the union of Goddess Parvati with Lord Shiva. They observe a day-long fast on the day which is believed to bring prosperity, good health and blessings. Devotees also perform songs and dances to celebrate the holy union Parvati and Shiva. The lines of worshippers at the Pashupati temple were well organised and managed this year, claimed Pradeep Dhakal, the member secretary of PADT. He added that security personnel, paramedics and volunteers performed excellently to make the festival a success. “I was inside the main temple within 45 minutes of joining the queue. Kudos to the organiser for their remarkable job,” said Sita Nepal of New Baneshwor. Mannu Dhari has been visiting the Pashupati Temple on Teej festival for several years now. The 78-year-old from Kadaghari was also impressed by the festival arrangements of this year. “I have been visiting Pashupati every year during Teej. The festival was better managed this time,” she said. According to the PADT, 4,000 security personnel were deployed in and around the temple premises to manage the crowd and to ensure the safety of visitors. “We wanted to ensure the safety and comfort of visitors since Teej draws the second largest crowd to Pashupati after the Maha Shivaratri festival,” said Dhakal. Girls and women in other parts of the country also observed Teej by observing fast and offering prayers at temples close to their homes. Glimpses of people celebrating Teej festival in different parts of the country on Wednesday. Teej is celebrated by Hindu girls and women to celebrate the union of Goddess Parvati with Lord Shiva. They observe a day-long fast on the day which is believed to bring prosperity, good health and blessings. This entry was posted in HINDUISM, HINDUISM - Highlights, INDIA, INDIA - Highlights, LATEST NEWS, LATEST NEWS - Highlights. Bookmark the permalink. Please provide your details to get our free newsletter. '*' indicates -- the details are required.